But that’s all prelude to the team’s top fantasy performers over the last decade, and … this shouldn’t be too hard to guess, really. Let’s take a look at the best Broncos fantasy seasons of the last decade. What, you were expecting Kyle Orton? Manning’s 2013 featured the all-time record for QB fantasy points until Patrick Mahomes came along in 2018. No quarterback not named Manning has topped 220 fantasy points for Denver in the last decade, but it was 2013 that Manning broke all sorts of records. You’ll see that year a few more times below. Phillip Lindsay was a revelation in 2018, rising from undrafted free agent to rookie Pro Bowler. And yet he finished the year more than 4 PPR points behind Moreno … per-game. Moreno was the product of one of the best offenses we’ve ever seen, but he was also good in his own right, putting up a career-best 76.9 overall PFF grade. And then after that … he played three more games the rest of his career. I was all geared up for the Broncos to have their leaders all come from the same season (spoiler alert: No team pulled that trick), but Thomas actually bettered his 2013 with an even better 2014, and that year he was also joined by Emmanuel Sanders finishing as WR5. The Broncos passing game under Manning, man. It was something. Thomas’ touchdown total fell from 14 to 11 in 2013-2014, but he increased his receptions total by 19 and his yardage by 189. 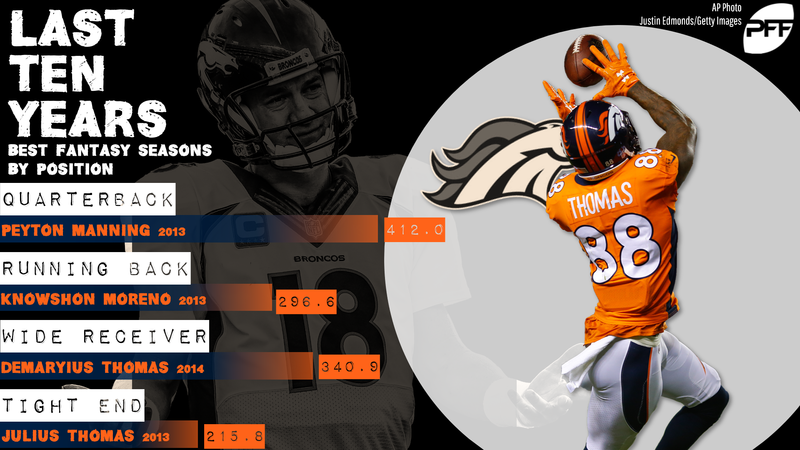 Before Tyler Eifert, Thomas was the poster boy for ridiculous touchdown rate, scoring on 13.6% of his targets in the Broncos’ ridiculous 2013 and then 20% in 2014. He was excellent when healthy and paired with Manning in 2013-2014, but injuries and having Blake Bortles and the ghost of Jay Cutler as his quarterbacks 2015-2017 left him far from the tight end he had been in Denver — he scored 12 touchdowns a year in 2013-2014, then 12 total the rest of his career before retiring after 2017. And behind those two Thomas years, Jacob Tamme in 2012, with 119.5 PPR points, is the only Broncos tight end within 100 points.